Take your dealership to the web, absolutely free. 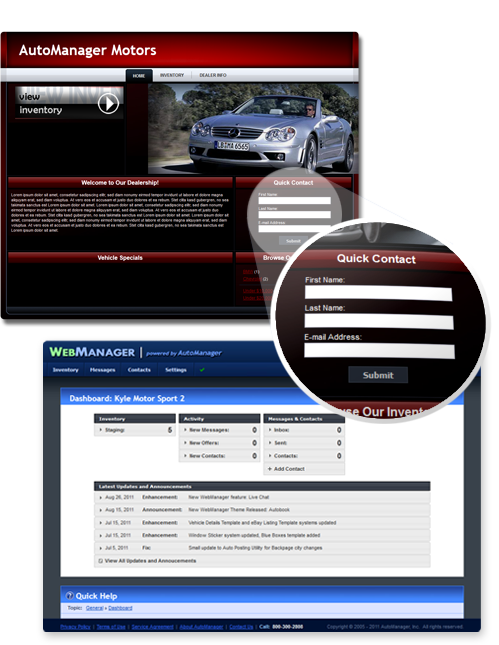 WebManager Lite is a simple solution for getting your inventory on the web, where so much of the vehicle shopping process now takes place. Your website can be set up in seconds, and will be immediately accessible to the public. Creating your website is simple and painless, and doesn't require any technical expertise. Uploading your inventory to WebManager is fast and easy too! You can configure DeskManager to send updates to WebManager automatically whenever you make any changes to a vehicle, or only send updates when you choose to for the vehicles you've selected. DeskManager will automatically upload up to four photos per vehicle (60 in the full version), and will synchronize any changes you make to your photos, including additions, deletions, and reordering; whenever updates are sent to WebManager. Vehicles you've uploaded to WebManager will be displayed immediately on your website, using a clean and attractive layout. Vehicle information is presented clearly, with photos displayed prominently. * Extra features like multiple themes, credit application forms, loan calculators, expanded inventory hosting and exports to more than 85 auto search websites require upgrade to full version of WebManager. WebManager Lite requires annual support. Website visitors can submit questions through the Contact Us form on your website or through the Ask the Seller a Question form on your vehicle pages. Contact records are automatically created in WebManager for each lead, and these leads can be reviewed and replied to through the WebManager Control Panel. Sets up in just seconds. To start using WebManager Lite now, download the latest version of DeskManager, click on the new My Website tab, and follow the onscreen prompts. WebManager Lite requires annual support, if your support subscription has expired and you would like to renew, please contact your AutoManager account representative at 800-300-2808. A 21st-century vehicle marketing system that brings you more internet leads and search engine visibility.